Provost and Executive Vice President Kenneth G. Furton (front, blue suit) stands with Faculty Convocation awardees Oct. 12. 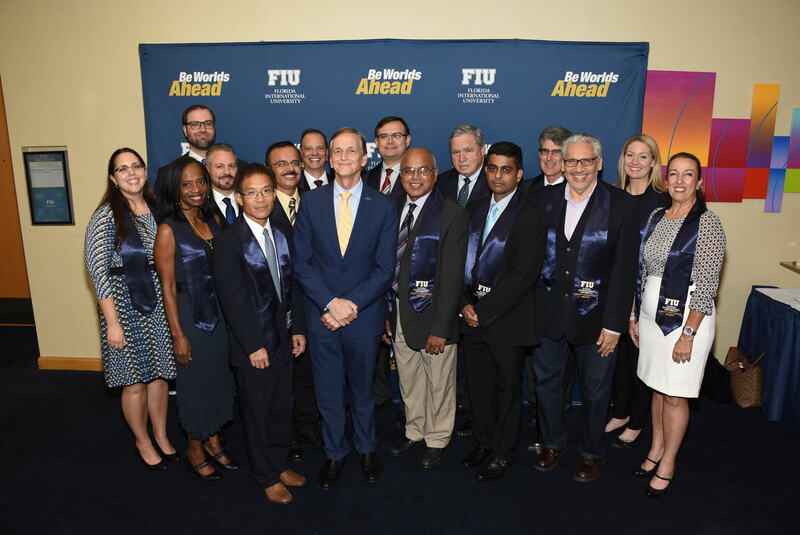 Each year, FIU’s Faculty Convocation and Awards Ceremony provides the university the opportunity to recognize faculty members for their commitment to the university and their students. The ceremony, held Oct. 12 in the GC Ballrooms, honors the achievements of faculty who have excelled in the areas of teaching, research, service, engagement, librarianship, mentoring and advising. The President’s Council Worlds Ahead Faculty Award, the convocation’s top honor, was awarded to Allan Rosenbaum, director of the Institute for Public Management and Community Service and a professor in the Steven J. Green School of International and Public Affairs. The award recognizes full-time faculty who make an impact in their field through research, partnership or creative initiatives; who promote student learning, innovation and collaboration; and who demonstrate distinguished leadership within the university. It also comes with a monetary prize, which Rosenbaum is donating back to the university in full to set up a permanent fund to support public administration research efforts conducted by students. In his role with the institute, Rosenbaum leads the university’s principal vehicle for working internationally in the areas of governance reform, decentralization, legislative development, strengthening local government and democratic institution building around the globe. The institute has been involved in many projects funded by USAID and other international organizations in Latin America, Africa, Asia and Eastern Europe. Earlier this year, Rosenbaum received the Enrique B. Rodriguez award for his work building local democracy and good governance in Latin America.